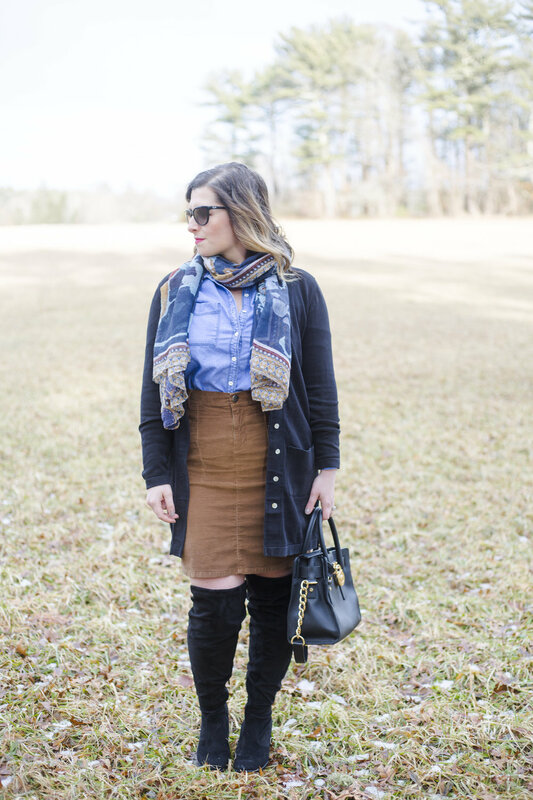 Making Over the Knee Boots Work for YOU! Hello, beautiful! I hope your week has been fabulous. Mine was a little cray cray. We've been super busy at work not to mention I've had something to do after work every night this week. Needless to say I can see some vegging in my future this weekend. Let's briefly talk about the outfit which I totally love & have worn to work. I feel so chic & European in it. The cord skirt is from J.Jill which I got on mark down, the shirt is old navy, & the cardi is Chadwicks of Boston. Over the knee boots have been around for at least two boot seasons. I was so afraid they wouldn't work for me. I am 5'2, curvy, & I have soccer legs (I'm talking legs that I could probably crack walnuts with). If you are like me with thicker legs, fear not! Our solution is to purchase wide calf boots. This pair from DSW fits like a dream. Okay you have conquered one issue: get boots that fit, check. Now you want these gosh darn boots to stay up! I was struggling hard one day so I took to social media to see how you keep yours up. One suggestion was to hair spray your legs. Which I tried at this shoot but didn't work for me, I probably didn't do it properly. Second suggestion, dress tape. I have yet to try this for myself because I need to pick some up. The last suggestion I received was to wear high socks, I tried this suggestion a couple days ago & it actually worked pretty well. I think that wearing knee high socks in combination with dress tape is going to be my best bet. How do you keep your over the knee boots up? Tell me in the comments below! Well fash dolls that concludes today's post! I hope if you had any doubt on whether you could wear over the knee boots that you will give them a shot. They seem to be a trend that is here to stay & worth investing in. Hello, beautiful! Happy Fri-YaY! To be honest I don't like being in front of the camera all the time. I am actually a hot mess & can be pretty awkward but I embrace it. For today's post it is nice to be on the other side of the lens. Anyway for those of you that are new here meet my friend Kelly of Freckled in Green . She is a boss babe in the financial industry with a great fashion sense. She is sporting this super cute lace up sweater with a corduroy skirt & completed this look with over the knee boots (one of the season's hottest trends). It is so important to invest in a good pair of boots for your wardrobe! Not only am I loving this outfit but the colors I am especially a fan of. Kelly is crushing it in her jewel tones. Jewel tones are intense bright deep colors typically associated with the winter season. These colors are like bright emerald green, rich purples, bright navy, burgundy, etc. Jewel tones look fabulous against nearly every skin tone, especially fair or olive. Myself am fair skinned I cannot pull of start weight, pale shades, & yellow. I'll never forget junior prom in high school when I wanted to wear a dress similar to Kate Hudson's when she played Andy in How to Lose a Guy in 10 Days. You know what dress I'm talking about, the yellow one from the diamond party. Well I tried on a dress in that color, I had never taken off anything so quick in my life. As there are certain styles of clothing that don't fit us properly there are also colors that either look fabulous on us or not. But jewel tones are defiantly colors that universally look good on everyone. 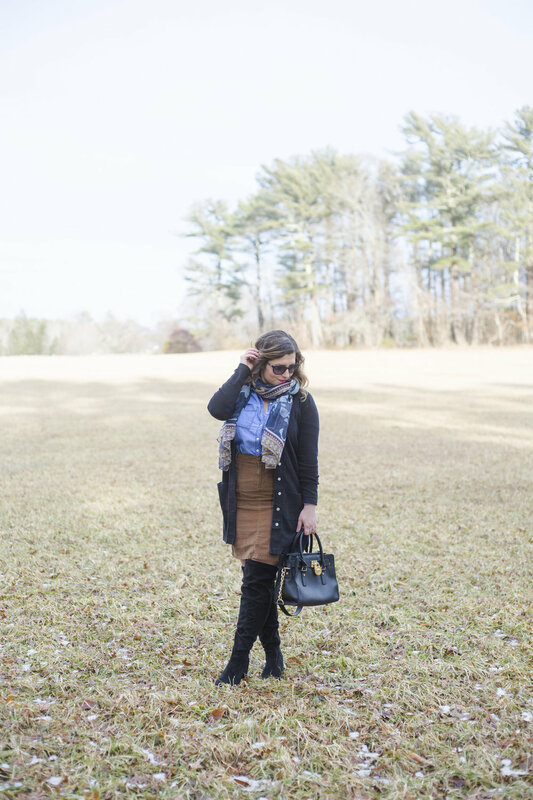 Now that November has come around, the weather is much more frigid and I have some tips to dress for success while still staying cozy. I'm excited to share this outfit with you all this week because it combines all of my current favorite fall pieces! A trend I love seeing come back into season is oversized sweaters. You see many people post about cozy/fuzzy/oversized sweaters and I wanted to join in the trend but recreate it into how I would wear it . One thing that I love about the oversized sweaters is you can really do anything with it! You can throw a pair of leggings on with some sneakers, or a jean skirt with stockings and booties or like I have done, you can a put it with a pair of jeans and some knee high boots. Oversized sweaters are great when you are having trouble finding an outfit, it is a simple wardrobe piece that works for fall and winter time while looking nice and staying cozy at the same time. With over sized sweaters I noticed it's easy to get away with wearing your hair up and it look really great! So if your running late you can just throw you hair in a messy bun and itll look awesome! Also, another piece of my outfit is the knee high boots. They're a great add on to an outfit because it makes the outfit so much more of a statement look and if I have them on for the day but know I'm going out later, the outfit is made acceptable to become a night out with friends! How would you rock your sweaters? Have you tried over the knee boots? Tell us in the comments below!